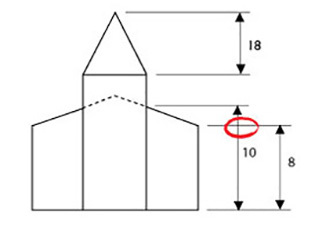 In this section you will learn about 3rd Angle Orthogonal drawing. This is a means for recording form in separate 2d views. It is a system with rules and processes governed by Australian Standards and agreed processes. 3rd Angle Orthogonal drawing is used in the field of Industrial design by product and furniture designers. 1 - What is 3rd Angle Orthogonal? Here is a hand drawn 3rd Angle Orthogonal by student Mariana Velo. What is a 3rd angle orthogonal drawing? 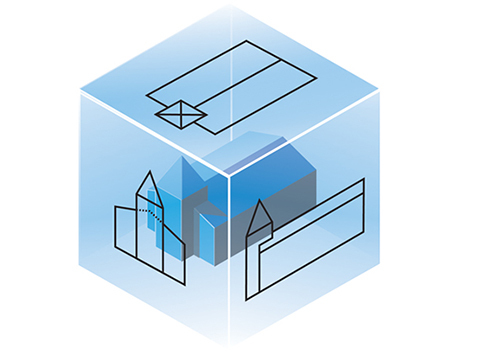 Watch the video to see how we can represent a three-dimensional object on a flat piece of paper by 'projecting' the views away from the object onto planes. In the video these planes are shown as a glass box. This set of flat planes is then folded out and become the paper on which the drawing is made. 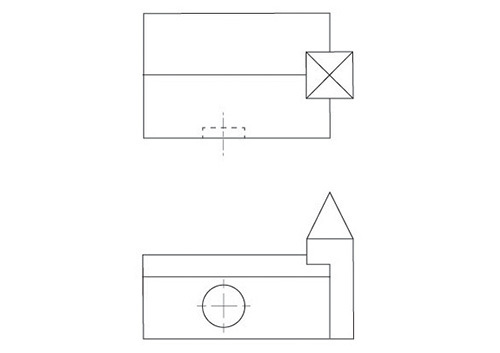 A 3rd Angle Orthogonal drawing is a way to show a three-dimensional object on a flat piece of paper. As you would realise we can't really draw all the sides of an object at once, unless we are Pablo Picasso! We need to separate the views and draw them one at a time. Which angle? 1st or 3rd angle? Why is the drawing called a '3rd Angle' Orthogonal? What happened to the 1st and 2nd angle? The reason is to do with where an object is situated relative to the 'paper'. So consequently, how it's views are projected. As you saw in the video of 3rd Angle orthogonal projection, the views are projected up and away from the object. It is as if we are tracing the views onto the glass box. We look through the views to the object in 3rd Angle projection. However, in a 1st Angle orthogonal projection the views are not projected up and away from the object but appear like a shadow behind and below it as if the viewer is wearing a headlight torch. Does 1st or 3rd Angle make much difference to the drawing? It makes a big difference. In a 3rd Angle Orthogonal the views of an object appear on their natural sides. That is, a RIGHT SIDE VIEW is on the right of a FRONT VIEW. But, in a 1st Angle Orthogonal a RIGHT SIDE VIEW is shown on the left of the FRONT VIEW! Think of the trouble you could get into building something from a drawing if you didn't know if your drawing is in 1st or 3rd Angle. But in 1st Angle projections, the views are shadows of the object. This places them opposite their natural position. Simple. We use a symbol to tell us. 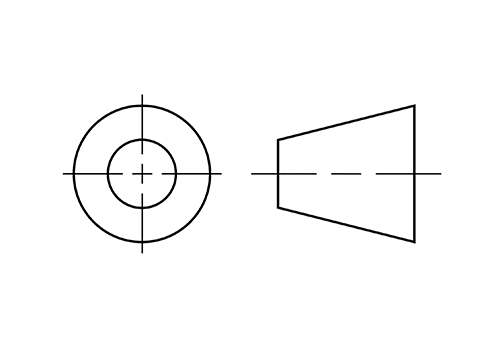 Here is the symbol for 3rd Angle Orthogonal drawings. Note that the short side of the cone on the right is next to the FRONT VIEW. What do you think the symbol for a 1st Angle Orthogonal drawing would look like? You must learn how to draw this symbol to add you your drawing every time you work with this method. Who uses them, what are they for? An Orthogonal drawing is a pretty serious kind of drawing. They contain all the details needed for making something accurately. They form part of a manufacturing contract so they have to be accurate. If a product is made 'according to the drawing' the maker can be paid. If it's not, the drawing will be used to show where it's wrong. Various kinds of Orthogonal drawings are used by product designers, engineers, pattern makers and automotive designers. An architectural variation on Orthogonal drawing is known as 'Plans and Elevations'. 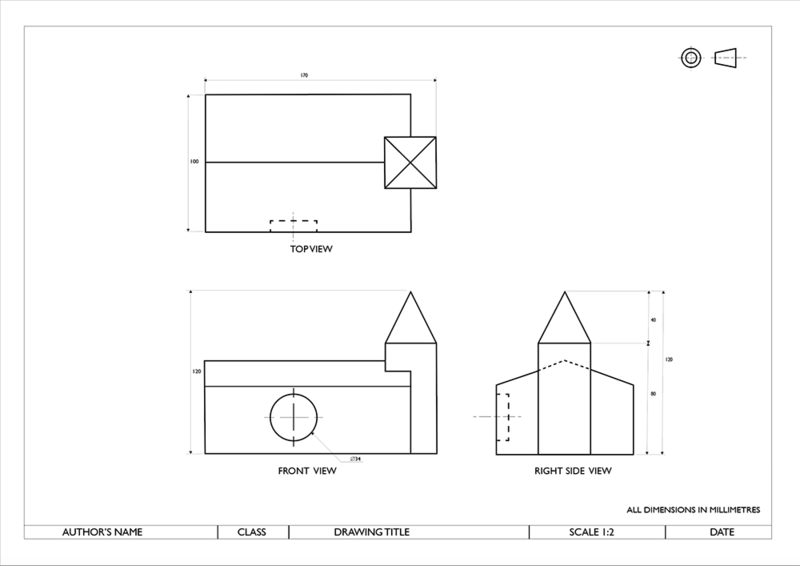 See the VCAA interpretation of AS 1100, the 2018 Technical Drawing Specifications Resource. This booklet includes all the information you need for Orthogonal drawings in our study all the way to Year 12. 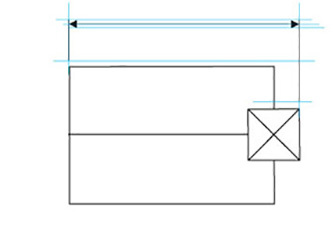 There are several procedures that make drawing your 3rd Angle projection a success. Let's take them one at a time. 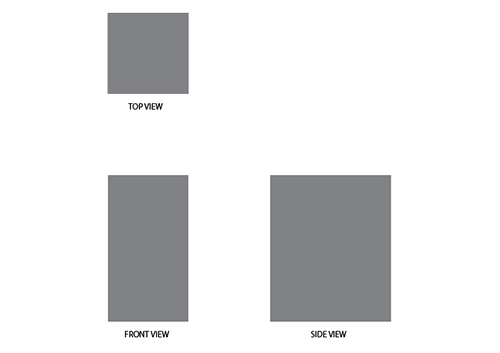 The orientation of the TOP VIEW determines how the view beneath it appears. 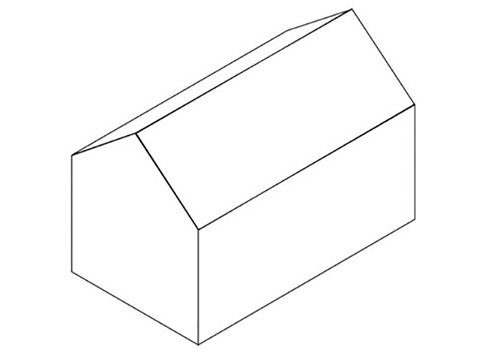 This is a 3rd Angle Orthogonal drawing of a box. There are three views in the drawing. Like the church in the animation, there is a TOP VIEW (looking down on the box). Then notice the name of the view under the TOP VIEW. It is called the FRONT VIEW. Is it really the front of the box? We don't know. It doesn't matter. What matters is that we know that the view that is under the TOP VIEW is always named the FRONT VIEW. So back to the original question. 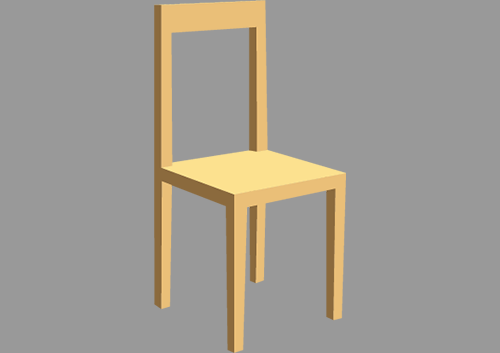 Which is the correct way to draw the TOP VIEW of the chair? 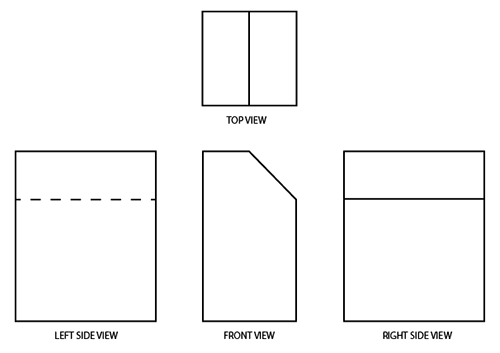 The Australian Standards says that the FRONT VIEW is the view that contains the most information about the form of the object. Therefore, the correct answer is 'b'. 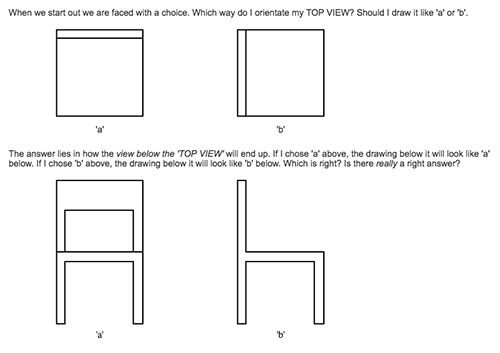 Draw the TOP VEIW so that the FRONT VIEW shows the side of the chair because this tells us more about the form of the chair. The first step to drawing in Orthogonal projection is to make sure your views are set out so they are aligned properley. 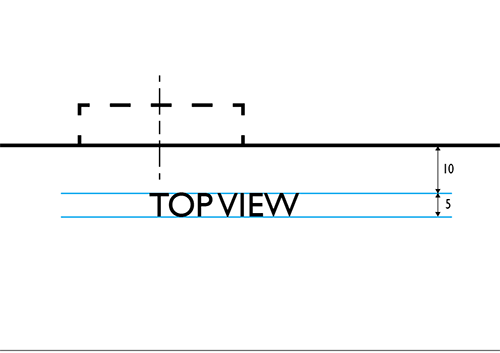 When you draw the first vertical line for the first view, draw it long enough for both TOP and FRONT views. 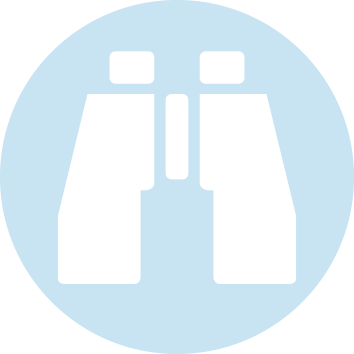 The drawing below shows how each view is aligned with the other views. The FRONT VIEW is perfectly below the TOP VIEW. The RIGHT SIDE VIEW is on the same line as the FRONT VIEW. Look along the blue lines to see the views line up. Make a 5 minute freehand sketch Orthogonal drawing of this 'Monopoly' house. Don't worry about the scale or proportions of the house, just make sure your views are correctly aligned with each other. You have to think ahead to leave enough space for each view. Continuous lines are used for Outlines and Dimension lines, Leaders and features that are not structural parts of an object. Chain lines made of different length lines and spaces are used to show centres of circles, axis of cylinders, and Cutting planes. 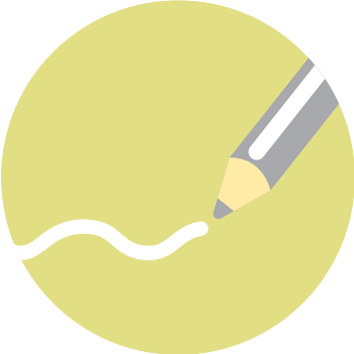 Thick or heavy lines are used for outlines of each part or view. Thick lines are also used for Hidden lines. 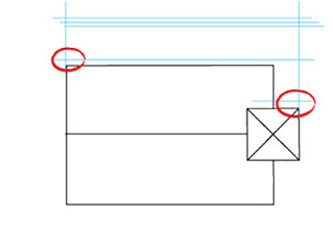 Thin or light lines are used for Dimension lines, Leaders (arrows), Writing and other elements that are not structural parts of an object in a view. Thin lines are also used to indicate Centre lines to show the centre point of a circle. This is also not a structural part of an object. See the explanation at left for the kinds of lines in this image. 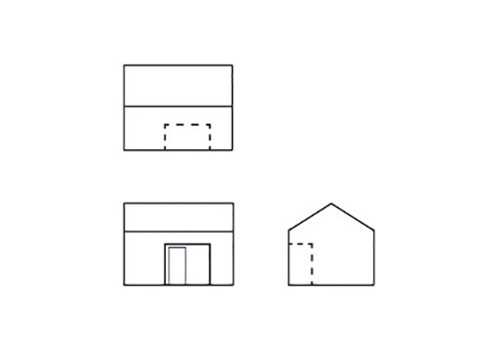 When there are details that are below or inside the surface of the object, show them with a dashed line. Hidden lines are normal thick lines. Use chain lines for centre lines for circles. You must show a centre (axis) line in the TOP VIEW and a centre cross in the other VIEWS. Centre lines are thin lines and go over other details. Each separate view in an Orthogonal drawing has a name. But remember, the names of the views doesn't relate to the names of the actual view of the object. The names of the views relate to the position of the views relative to the TOP VIEW in the whole drawing. Here is a picture of all the views in the correct position relative to the TOP VEIW. Don't forget to show centre lines on each view in the correct way. Follow the directions shown in this video to make a drawing of the Monopoly house shown above, to scale. 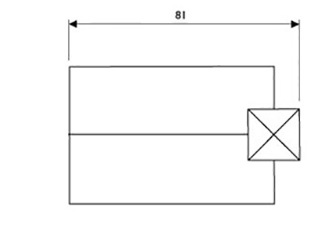 Use a tee-square and set-squares. Follow these directions for completing your drawing accurately. 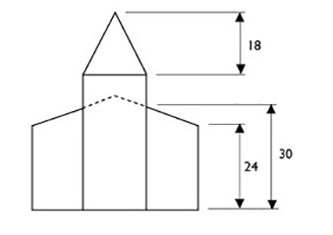 There is a set technique for drawing and dimensions. 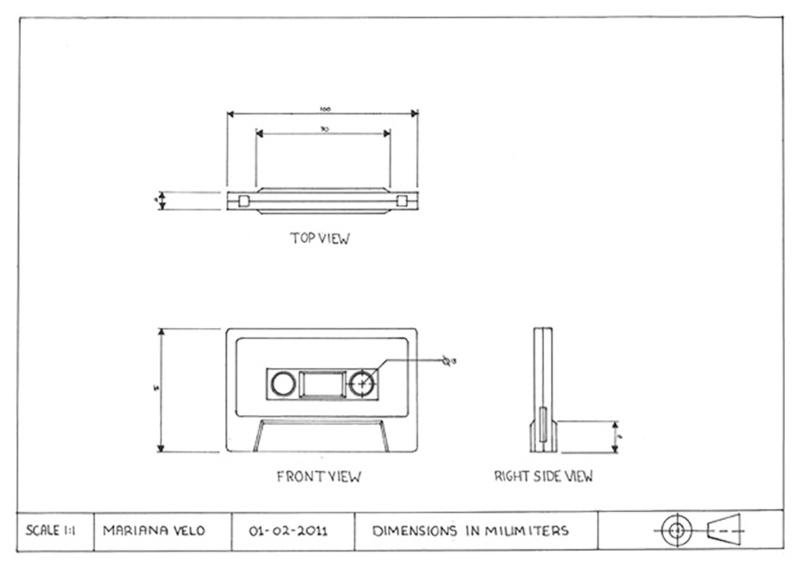 Here are the components of dimensions on Orthogonal drawings. 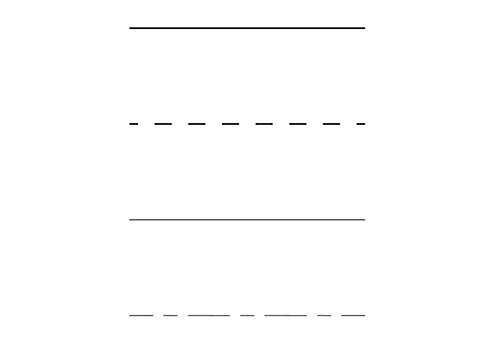 These are the lines that extend from points on the drawing outwards. They are an extension of existing lines on the drawing. They do not touch the drawing, but begin about 2 mm from the edge of the drawing. They extend just past the dimension line. They are thin lines. These are drawn parallel to the object. They just touch the extension lines at each end. These are thin lines. These are little triangles about 3 mm long and 2 mm wide. They are coloured in solid black. Each dimension line begins and ends with an arrow head. Dimension lines carry the measurement of the length of the dimension. Draw numbers in the same sans serif font as your name labels. The numbers show the actual length on the real object not on the drawing regardless of the scale of your drawing. Do not write 'CM' or 'MM' beside the numbers, do this in the main title box of the sheet. Do not break the dimension lines for the numbers. On vertical dimensions you may write the numbers horizontally or vertically - as long as you do it consistently on each dimension of the drawing. Circles are shown by marking the diameter of the circle. Leaders are the name for the arrow used. They touch the edge of the circle. See below for an example. The dimension numbers always indicate the actual size of objects despite the scale a drawing might be made at. Always write the full size dimension on your drawing - not the size something is on the drawing. See below the process of adding dimensions to your drawing. Remember, careful planning is required for accurate work. 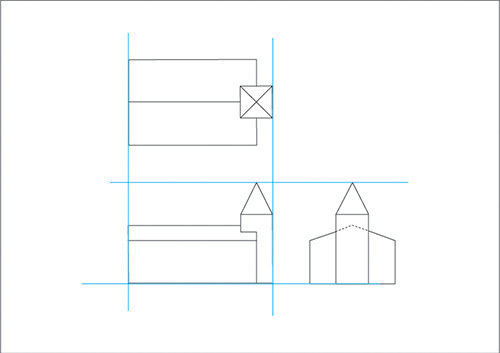 Draw a set of construction lines to help you locate your projection and dimension lines. You will need 3 lines for each dimension line, as you have to form up your arrows. The red circles indicate the gap between the object and the extension lines. Once you have your construction lines you can draw in the final extension and dimension lines. Extension lines (the vertical ones here) begin 3 mm away from the object and project 3 mm past the dimension lines. Draw in a pair of 3 mm wide arrows at the ends of your dimension lines. They are neat triangles and are coloured in. The numbers to indicate dimension are written above or to the side of the dimension line. The numbers refer to the actual size of the real object. The scale of the drawing takes care of what length the object in the drawing appears to be. Do not include the unit of measurement (Millimetres, Centimetres, etc). The unit of measurement is written in the title box of the drawing. With construction lines removed, you can see one set of dimensions. Draw dimensions on the other side, keep your dimension numbers horizontal. Do not break the dimension line. Locate your centre 'cross' chain in the correct place first. To dimension a circle draw a leader extending from the edge of the circle at 45 degrees. The leader must touch the circle but not overlap it. Draw the same kind of 3 mm arrow head at the end of your leader. 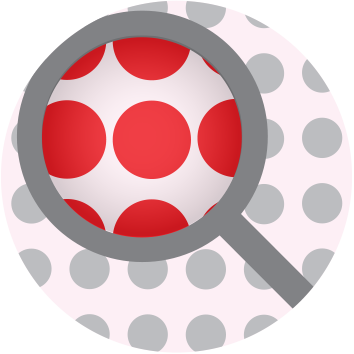 The size of the circle is annotated by a numeral and the symbol for diameter. To do intermediate dimensions you have to plan them carefully. This example is INCORRECT! You must not cross extension lines. This drawing shows the CORRECT way to do intermediate dimensions. The larger ones go outside the smaller ones. 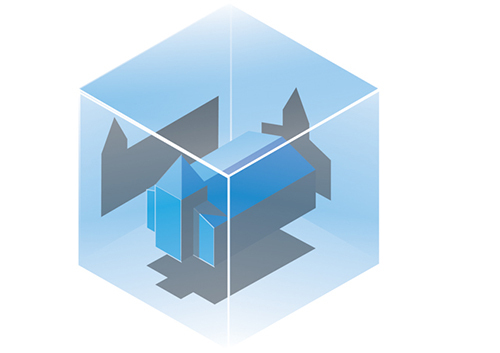 The completed dimensions. 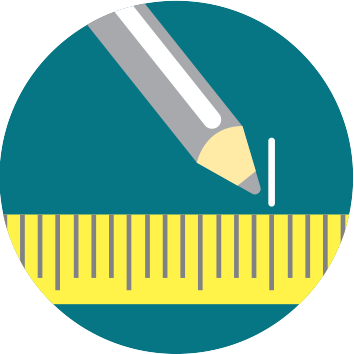 You are asked to show overall dimensions that indicate the Length, Width and Height of an object as well as some intermediate dimension and the size of circles. You will do your 3rd Angle Orthogonal drawing to a scale. A scale means the relationship between the real object and your drawing. In most cases you will have to do some maths to work out an appropriate scale to use. For architectural design use; 1:20, 1:50, 1:100 or 1:500. Don't make up your own scales even if they will help your drawing to fit on the paper better. Scales are part of the standards and conventions you are using. 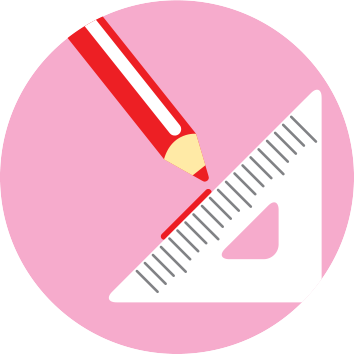 Draw the lines in scale but write the dimensions on your drawing as if they are the real size. 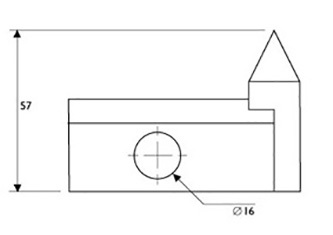 A formal 3rd Angle Orthogonal drawing must be finished with annotations to provide information about the object drawn. Refer to the information below. Name labels are done in a consistent way. Draw 'Sans Serif,' capital letters. Align them neatly on horizontal guide lines. Centre them under each view. Use the dimensions shown here as a guide. This picture shows how to draw text within simple construction lines. Name labels are done in a consistent way. Draw 'Sans Serif,' capital letters. Align them neatly on horizontal guide lines. Centre them under each view. Use the dimensions here as a guide. 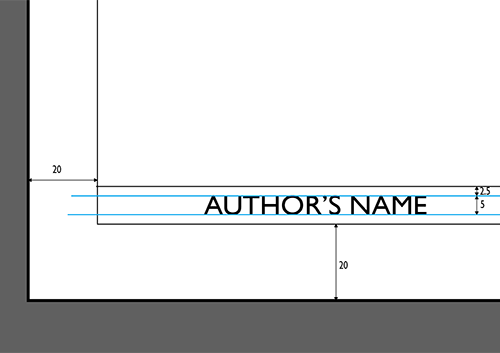 A border is drawn around the edge of the page. On A3 and A2 it is usually drawn 20 mm in from the edge of the page. On A4 it is drawn 10 mm from the edge. The title block is drawn at the bottom of the sheet. This usually extends right across the sheet as shown in the example at the top of this page. Make your title block 20 mm high. 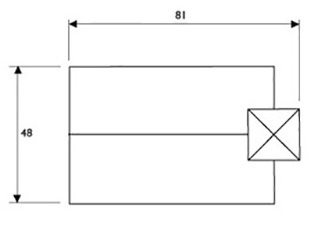 This example shows the three views, different line types and strengths, dimensioning, the 3rd Angle Orthogonal symbol and border, title box and annotations. A Section is a short way of saying 'cross section'. It means how something looks when it is cut through. 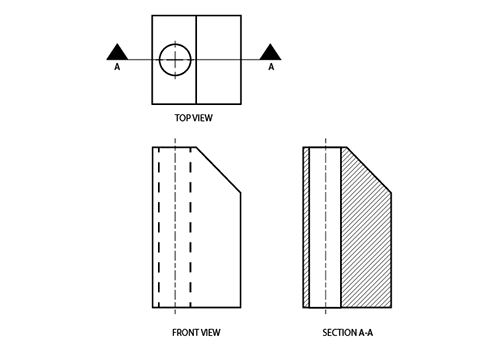 Sectional views are used to show how the inside of an object looks if it were cut in two. 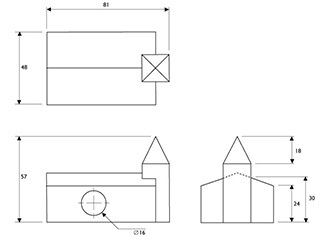 There are several components to sectional drawings. This marks the place where the object is 'cut'. This is usually shown on the TOP VIEW. 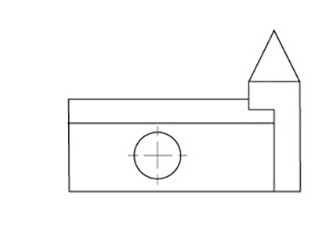 The cutting plane is shown by a thin line across the drawing with two large flat arrow heads. The direction of the arrow heads indicates the direction of view for the sectional view. 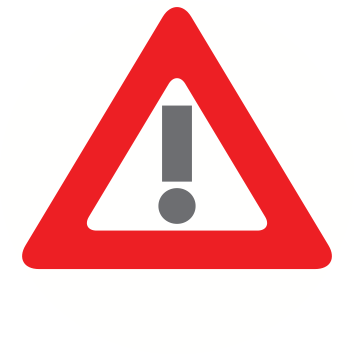 There are also letters given next to or below the arrow heads. This names the section. In a drawing there may be several sectional views; A - A, B - B, etc. Solid material is shown with a texture of thin parallel lines drawn at 45 degrees. This is know as 'cross hatching'. Different physical parts of an object are shown with the cross hatching drawn in the opposite direction. Look at the example; Note the hidden lines have been replaced by continuous lines. Why is this? Note the way the arrows indicate the viewing direction and the cross hatching indicates solid material. 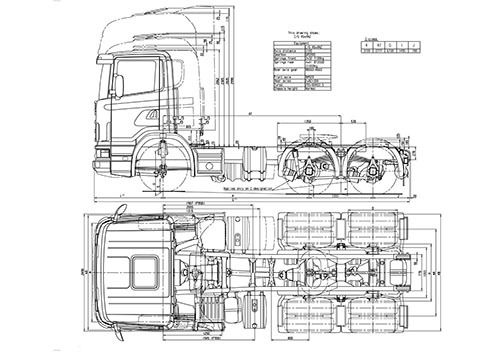 Sectional drawings, sometimes called 'cross sections' or just 'sections' are not required in the VCAA VCE study of Visual Communication Design.